Phishing is dangerous, it targets groups of people in an attempt to steal financial information, usernames, passwords, or compromise the security of your computer / mobile device. Phishing email content is general enough to target a large audience such as all customers of a bank or website. The content of the email appears to be legitimate but close inspection of the message content can raise suspicion that the email is not valid. Links in the email: check the link and verify the link text to the link destination. Does the link direct you to an unknown website? If the email has an attachment, you should evaluate the attachment. Are you expecting an attachment? Verify with the sender. Save the attachment and scan with anti-virus before opening. Often previewing a file is enough to infect your machine. Spear Phishing is similar to Phishing except the attacker is targeting an individual or small group of people with well-crafted emails that are harder to detect compared to phishing campaigns. 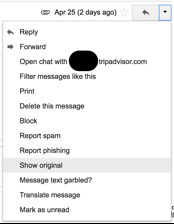 Save the original phishing email as an attachment. Do not forward as we need the original email for our investigation. 2. 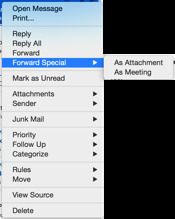 Either "right click" or "control click" (for MAC) on the message, select "Forward Special" and select "As Attachment"
Other email clients and webmail clients have slightly different ways to access the information that attaching an email gives us for investigation. Please "google" how to do this or view the email client's help menu. For Gmail the user has to show the original email and cut/paste the results into a new email. This will give us all the information that we use for investigations as well. 3.Send the new email to us with a description of why it is phishing/fraud.